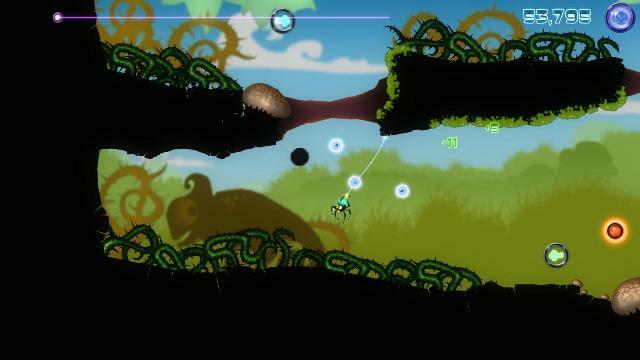 Heading to XBLA later this fall, Enigma Software’s Alien Spidy is a game that’s about as true to the descriptor “traditional platformer” as modern games come. It doesn’t arm the player with crazy weapons. It doesn’t have sandbox, shooter or RPG elements. Its story is set up with the time-honored tradition of the protagonist’s girlfriend going missing. 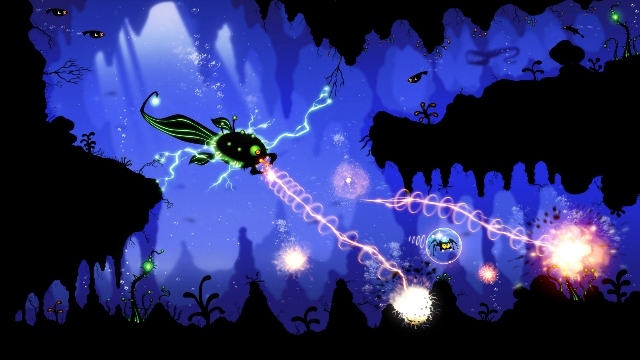 Players guide a space-traveling spider from left to right and run, jump and swing over enemies, pits and other environmental hazards. Simple, right? Maybe when broken down like so, but it also has that other element of the classic platformer: when you play it, you sometimes die. Certainly it’s not the first game on modern consoles to make simply progressing from left to right a challenge. Other games featuring far tougher gameplay have come and gone over the past decade, but it’s still a trait worth mentioning. Alien Spidy approaches difficulty by stripping the player of any and all offensive capabilities, putting deadly hazards in his way and keeping him coming back for more with a forgiving checkpoint system. Anyone who’s played a platformer before can pick this one up and immediately start progressing, but don’t expect to do so unchallenged. 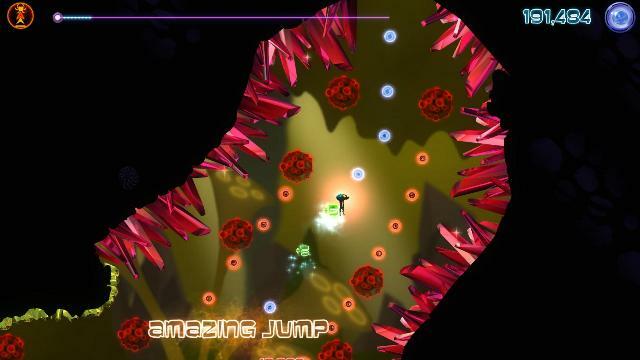 To find out more about how the game works, XBLA Fans spoke with Enigma CEO Daniel Parente. 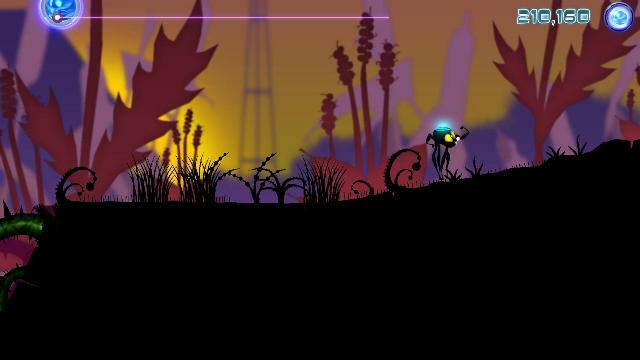 Alien Spidy is, as the name implies, a game starring an alien spider. Now, it seems to me that there are plenty of good (bad?) spiders right here on planet Earth, so I have to ask: why make the character an alien? Daniel Parente: Indeed there is quite a lot of spiders on Earth, but we thought that an alien one would give us greater freedom to make it different and less “spidery” with a more human touch to avoid the arachnophobia to take place. Plus, an alien spider was giving us the logical possibility of [a] player with power-ups [and] a cool spaceship. Aside from jumping, Spidy’s go-to move is shooting out some webbing and swinging by it. One member of the XBLA Fans staff got a bit of a Bionic Commando vibe from it. Did Capcom’s robot arm inspire the team in that regard? Parente: To be honest, no. The web string was something more or less at the beginning of the game, but largely underused. As we progressed with fine-tuning the game, we faced a struggling need to make the game fun. It took us a while to finally focus on what is the primary capacity of [a] spider: to make web strings. While playing the game at PAX Prime I snatched a few different temporary power-ups that allowed for some slightly more complex platforming. Are there any permanent power-ups, or are they all temporary? Parente: All the power-ups are temporary because we wanted a fast-paced action game where decisions and actions must be committed while dashing toward challenges with the tension of knowing that the power-up will be ending soon. What about the web-slinging? Are there any pick-ups that affect that mechanic? Parente: Initially, yes, there was. We were able to move objects with it or to interact with other objects to perform more complex actions such as catapulting. All of the items I saw in my limited time with the game afforded Spidy extra defensive or platforming abilities, and it’s my understanding that he never gains any sort of ability to attack at any point in the game. Was that something that the team planned right from the start? Parente: Yes, we intended right from the beginning of the game to avoid attacking enemies. We wanted the game to get away from it; we saw that the charming look of the game would make it hard to have a spider destroying ladybugs, bats, wasps and other inoffensive animals and insects. Plus, we thought that having to avoid them or use them would make an exciting mechanic for the player. Did you ever worry that not putting in any offensive abilities would alienate (no pun intended) some gamers considering that so many cartooney platformers over the years have conditioned players to jump on enemies to take them out? Or has the team remained totally confident that the game stands on its own without that sort of thing? Parente: Partially, we thought about it. We already had taken the decision to avoid “killing” enemies, but yes, it would be also a good reason why we intended to do it. So despite not having the ability to attack anything, Spidy still has to face down some bosses along the way. Can you shed some light on how exactly he can fight without, you know, fighting? Parente: Like Bruce Lee said, “Be water my Friend, be water.” You can use the strength of your enemy to your advantage — you only have to discover how, while avoiding them. We thought that it was indeed a cool mechanic, rushing through a level, avoiding traps and enemies, while thinking how you can use your enemy to help you. I understand that the final game has 69 levels in it, and this is the first platformer that Enigma has developed. How challenging was it to create that many original stages? Were there any unique level design challenges that came up during development that the team hadn’t anticipated? Parente: The game suffered a huge transition during the development phase. It took us approximately one year before we were able to finally make all the pieces come together, initially the game was much slower and more geared toward physic[s] puzzles and other typical mechanics, but when we looked at the game, we felt that something was missing; the game was not fun to play. It was certainly gorgeous, everyone loved the visuals, and character designs were well-done with characters that were charismatic. It was precisely the character design of Spidy that made us understand what we were doing wrong. As the lead designer said, you have to find the voice of your character and to learn how to listen to it because if you are not doing so, you are forcing it to be unnatural. It was when we saw that Spidy was telling us, “I am fast; with my web string I can do cool acrobatic stunts” that we finally saw where to head. After that it was easier. We still had a couple of problems with the lengths of the levels, as we initially tried longer levels, but then we saw that the maximum fun was when playing with shorter levels filled with adrenaline. Players can unlock some additional stages by scoring high enough on the regular maps. Getting those high scores is, to say the least, not easy. Was there ever any internal discussion as to whether or not the ranking system was headed in a direction that was too difficult? The game is easy to play, and just about any regular player will be able to finish the game without breaking too [many] gamepads. The players that do end up unlocking all of the extra stages are probably the type that enjoy a stiff challenge, so can we expect those stages to be even more punishing? Once the whole game is completed, does an even more challenging mode unlock by chance? Maybe one with fewer checkpoints, or even none at all, for the true challenge-seeker? Parente: The game has different challenges, and if you observe closely one of the factors is time, so even if you are able to get all the orbs in the level, in the right sequence, you will still have to factor to see if you can improve your time. Do you feel like the liberal checkpoint system is necessary to keep players from getting too frustrated by the tougher sections of the game? Parente: Yes, right at the beginning of the new game [we designed] toward fast-paced action, we saw that the checkpoints would have to be quite benevolent, and we would have to make the player get back in place quite fast, if not, they would [lose] the interest. What would be the point to be killed 10 times at the end of the level and be shipped back to the beginning? It would be an unfair punishment, and one of our golden rules, is that the player must be respected by the game creator. Between all the standard levels and the unlockable ones, it sounds like there’s a good amount of content to Alien Spidy, especially considering that most players aren’t going to mindlessly breeze by the various obstacles and enemies unscathed. But were there any design ideas that had to be cut out of the final game? If so, can you talk a little about why they didn’t end up making it in? Parente: Yes, we had to cut a lot of things that we intended to have in the game. If the game is successful, we are thinking about ways we would be able to get them in potential DLC or on Alien Spidy 2. So there’s a chance we’ll see some of those cut ideas in the form of post-release DLC? Parente: Certainly. There are a lot of cool ideas on the drawing board, and the players will be able to get them if Alien Spidy is a success.